Bring fear to your competition with the Hammer Phobia bowling ball. 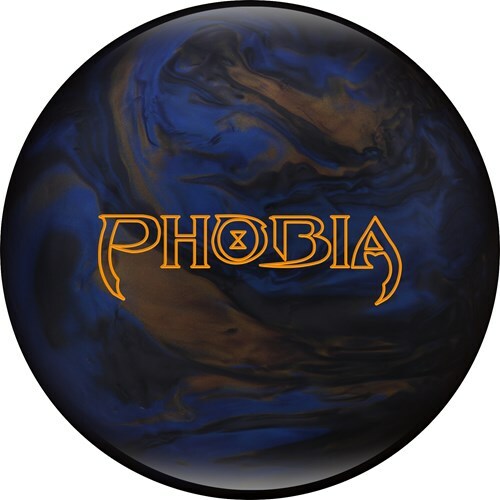 The Phobia is part of Hammer's upper-mid performance line which includes their legendary Black Widow bowling balls. This ball introduces the Phobia core to the Hammer line. This core is symmetric and powerful. The successful Semtex coverstock is used to cover this ball and generate a strong and angular backend motion. The pearl additive offers more skid through the front of the lane and gives this ball pattern versatility. The cover is finished with a 500 then 1000 Abralon pad and then is polished with the Powerhouse Factory Finish Polish which helps the ball store energy. This bowling ball is Carbon Fiber Infused! Carbon fiber is one of the toughest materials on earth. Hammer decided to add this material to the inner core of this ball for added strength and durability allowing them to offer an incredible 3 year warranty. Was curious about this new addition to the Hammer line and where it would fit, so after drilling mine with a pin down layout, I am quite impressed with the ball motion that I see with the new Phobia which fits perfectly in the Legend series and offers a symmetrical core in this line. For me the Phobia is cleaner and a bit more angular overall compared to the Scandal Pearl and it is definitely stronger than the original Rebel so it fits perfectly in between those two balls. The Phobia really shines when you need to get inside the pattern and need a ball to turn the corner in the backends for various medium lane patterns. It will allow various styles of bowlers be able to start straighter and chase the oil if needed. I see the Scandal Pearl a little earlier and rolly compared to the Phobia which offers a skid/flip backend motion that does not stop cornering. The Phobia is about 3-4 boards weaker overall than the Scandal Pearl, but stores up more energy down the lane, and is about 3-4 boards more than my Rebel Pearl. I really like what I see in this new release from Hammer and I think this ball will be a must have ball for those that are looking for something that offers a great motion to have an angular symmetrical rolling ball in your bag. - it really continues through the pin deck! Very versatile ball… You will be impressed! Comments: So I drilled my Phobia using a 70 x 5 1/2 x 65 layout, which put my din down and under my bridge. I was very impressed by the motion of this ball. Even though it has a symmetrical core it is more angluar than my Scandal Pearl and a little cleaner through the mids. This ball will fill the gap in my bag between my Scandal Pearl and my Rebel. Likes: I have a 60 x 4 3/4 x 55 on my Phobia . This ball will fill a gap between my Rebel and Scandal Pearl . Ball is a bit cleaner than Scandal Pearl and goes through the pins a little bit more ( more angular ) . Where I have left half 10's if i got my Scandal Pearl in the oil , this ball stored up a bit more energy for me and the pins just seem to fly around . Being a symmetric core ball , I didn't expect it to be more angular than my Scandal Pearl . Likes: Smooth through the fronts and strong arcing motion on the backend. It really hits like a tank! Greetings Hammerheads and Hammer Nation. I love the Phobia Pearl ball. I have a 60 x 5 x 30 Dual Layout on my Phobia . This ball will fill a gap between your Gauntlet, Dark Legend Black/Blue Solid, Dark Legend Hybrid, Dark Legend Red Solid, Rebel and Scandal Pearl series . This ball is a clean through the fronts and goes through the pins a with a nice arcing angle. Great 2nd ball when the Scandal Solid, Dark Legends, and Rebel Solids start to lose energy. Thank you Hammer for providing us with weapons of mass destruction. Likes: Very clean through the heads, and a nice arc off the pattern. Ball hits fantastic for me. Best Hammer ball (for me anyway) since the Road Hawg. Dislikes: None. I would imagine it not being good on the extreme dry or oily conditions. Hammer advertises a symmetric ball to compliment the Gas Mask Core reaction. I could not have stated it better with the Phobia. Smooth through the fronts with a controllable back end. Great medium oil and transition ball. Can't wait for a solid with this Phobia Core! Page created in 0.687 seconds with 23 queries.